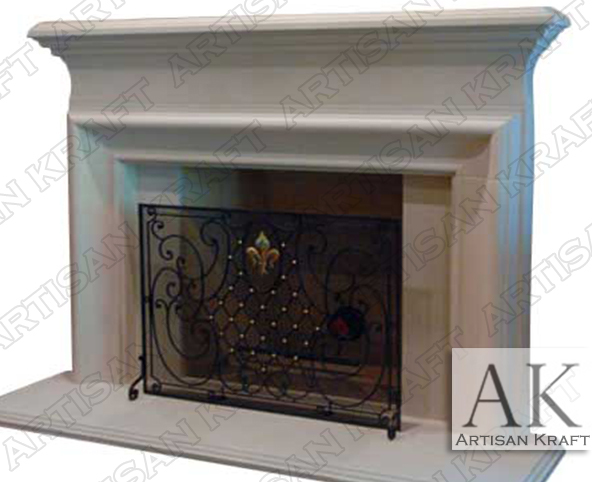 Clermont is a simple French design fireplace pictured in cast stone. Looks great in marble too. This can be made to your custom dimensions. This is an old French world design that is still very fitting today. One of our many French Historic Replica designs. Clermont serves well in a traditional home as well as a more modern contemporary space. The photo is of a cast stone mantel but marble, limestone and other options are available. Artisan Kraft delivers fireplaces to PA and IN we also deliver to all the other states. Many other options available. Stone: Travertine, precast, limestone, sandstone, marble etc.